Stone Cold Steve Austin is of course, the Texas Rattlesnake of WWE fame. And he stars as a border patrol agent whose partner is killed investigating a trailer home meth lab. After this pre-credit roll tragedy, he seeks peace and quiet. He leaves the Lone Star State for the quieter confines of Montana. However, things aren’t that quiet up there either. He and his obnoxious teen daughter are kidnapped by a bunch of irate bank robber thugs who’ve been double-crossed. Their ex partner has absconded with their money and Stone Cold, with his knowledge of the backwoods, comes in handy to track the guy down through the forest – in exchange for his life. 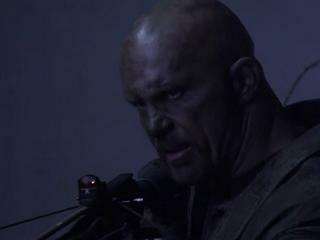 With the exception of The Expendables, Stone Cold has been in a slew of terrible direct-to-DVD duds. And Hunt to Kill is one of them. In this show we talk about terrible action films lensed in British Columbia and how there is no honor among thieves in heist flicks. Also, how relatively few WWE superstars have made the transition to bona fide actor, awful dialogue and how it’s imperative that the title of a movie is said in a bad action movie. We also delve into the acting talents of Eric Roberts and Gil Bellows.